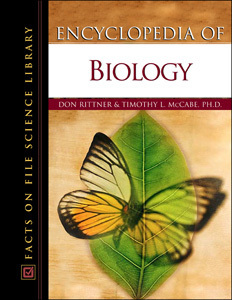 Authored by: Don Rittner and Timothy L. McCabe, Ph.D.
Encyclopedia of Biology is an invaluable reference that provides authoritative information on the subject for high school and college students. The encyclopedia contains more than 800 A-to-Z entries and essays, 80 line illustrations, and 75 black-and-white photographs. Comprehensive coverage of leading discoveries in biology along with general biology definitions, thought-provoking essays, and biographies of notable biologists present a wide range of valuable information compiled into a single source. Written in an easy-to-understand format, the book helps explain the importance of biology to society, and includes summaries of notable events throughout history related to the discipline. An emphasis on "hot" topics and detailed coverage of the fundamental issues, figures, ideas and concepts, experiments, and history of biology make the encyclopedia current and relevant to student interests. The book guides readers to the Web sites and various resources on the Internet that relate to biology. Appendixes include all Nobel Prize winners in biology, a review of biology-related computer software, and the complete Periodic Table of Elements. "...will aid students in understanding basic concepts." "The volume contains numerous black-and-white illustrations that enhance the text...clearly written..."
"...useful as part of a reference collection in a school or college library."